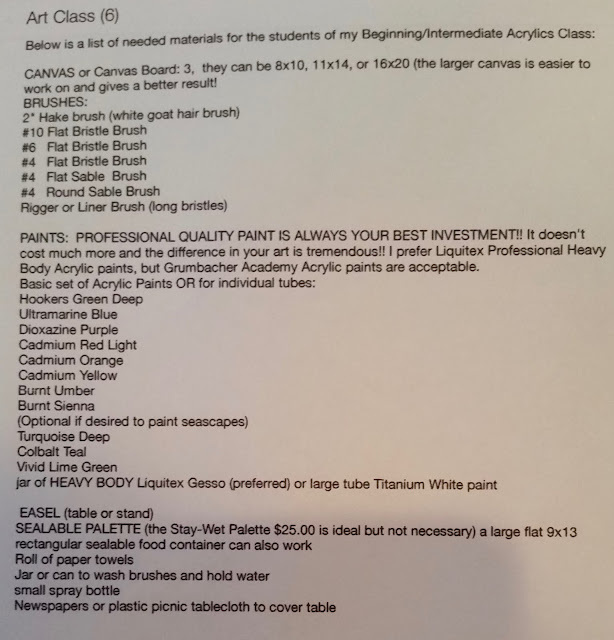 For those of you who live in my area I have a list of supplies for my upcoming Beginning-Intermediate Acrylics class through the St. Johns Community Education. But even if not, this is a good list to use when you shop for supplies for your own work area. I have a photo below of the list. Since I put this list together, I came up with some more optional, but good to have items, and a caution! A RULER or YARDSTICK- these can also be used as a MAHL stick. It is used to support your working hand to prevent touching wet paint on a vertical surface. The advantage of a Mahl stick is that they can collapse to fit into an art bag. If you use a sealable food container, be sure to get the foam sheet and palette paper to go inside. Otherwise the paint will dry out. They come with the Stay-wet Palette. 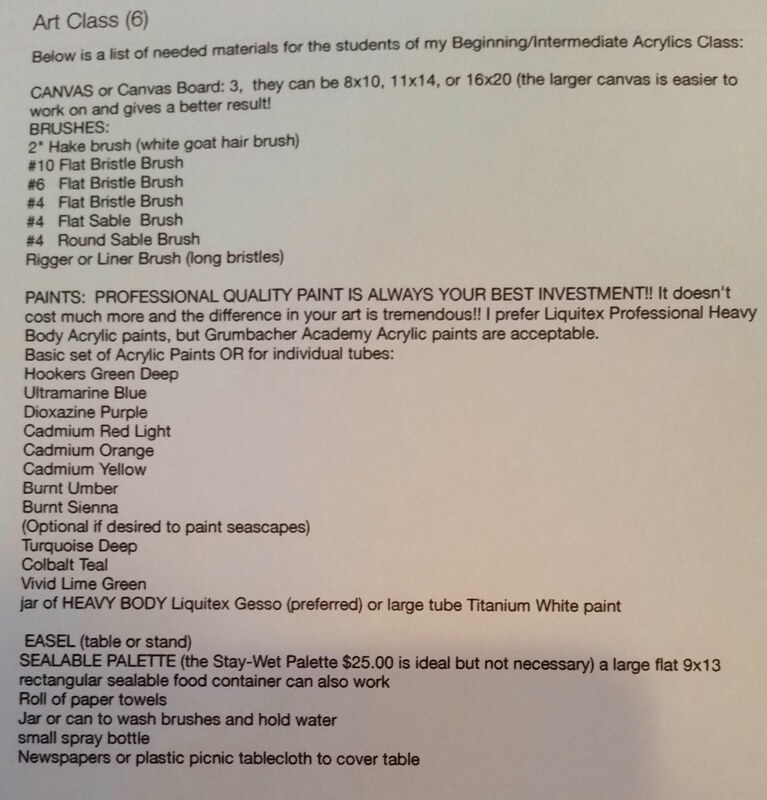 Now for the Caution: DO NOT USE LIQUITEX BASIC PAINTS!!! Yes they are cheaper, BUT that means they have less pigment and therefore give unsatisfactory results and even can break down and flake off over time! 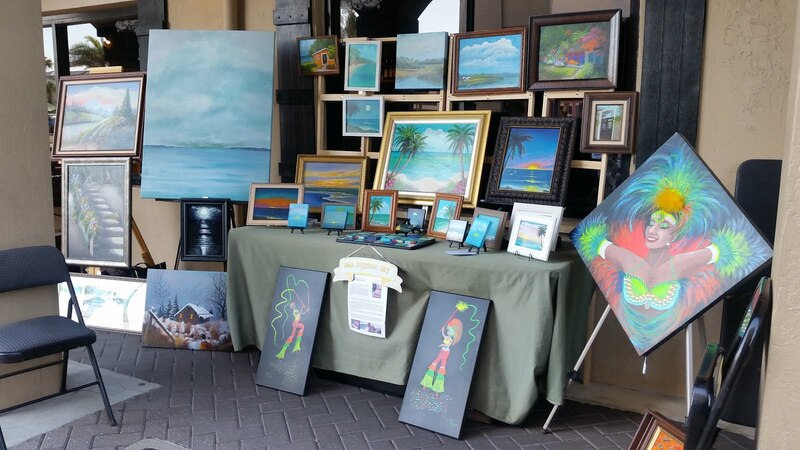 You are FAR better off buying the professional paint even if you have to buy one at a time. They are not really that much more expensive especially as they go further and take less paint to get the same results! However, most if not all large art or hobby stores give electronic coupons worth 40-50% off regular prices. Use them! I do all the time. I always try to purchase my supplies on sale when possible, but like everyone I end up getting something not on sale and then I whip out the trusty coupon on my phone. It saves a lot of money over time. On another note, Tuesday May 9th was the Art Walk I attend. I had a larger display than I normally do. (photo below) but looking back I don't think that was a good idea. People didn't seem to know what to look at. Too much eye candy if you will. I think from now on, I will take fewer items and see if that works better. Yes, I had sales, but I want to try this and see if it makes a difference, at least for now. At the very least, it will be easier on my back, not having to carry so many things to the car and back. LOL!! One thing I enjoyed a lot was that two of my good friends got spots right next to mine. So we had a good time visiting as we worked. Always nice, agreed? I also need to get lights! It didn't get dark until after 8 pm, but as the sun was setting the glow on the two far left paintings caused quite a stir among visitors! Interestingly, after the sun went down no one noticed them. Lights make ALL the difference! I am now convinced of that. I should have known, after all what do galleries have?